Go back in time and imagine a native village on the saltwater shoreline of southern British Columbia surrounded by giant Douglas Firs. Witness the last spike being driven in the trans-continental railway on the shore of the western frontier. Now picture a beautiful Art Deco bridge connecting Vancouver’s downtown core to the prosperous west side. Fast forward, zoom in under this bridge, and familiarize yourself with a no man’s land overgrown with wild blackberry brambles where homeless people settle in for the night. You will now arrive at the site for a recent ephemeral art installation: Belonging: sous le pont. 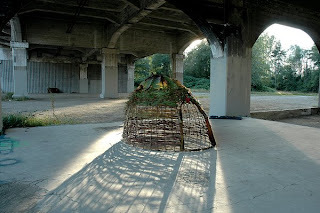 One of the first things you will notice is the word Belong, woven from willow branches and hanging between the concrete pillars of the bridge above a small hut made of twigs. This word raises the questions: Who belongs here? How do we as citizens negotiate public space and the notion of ownership? In this instance, the ownership of this plot of land has been contentious since colonial times because the area is divided between the city of Vancouver, the railroad and the Squamish Nation. This land may be divided up between the many parties who want access to the upscale area of Kitsilano, but it is generally regarded as abandoned and wild. Like many undeveloped lots in cities, it attracts street culture in the form of graffiti artists and is home to itinerants who fabricate makeshift dwellings. Guerrilla gardeners, cyclists, commuters, boaters, students attending the nearby music school and the Emily Carr Art Institute on Granville Island also encounter this site on a daily basis. This site-specific project continues my art practice as an eco-artist working in the realm of ephemeral art installations. Like the artist Andy Goldsworthy, I work predominantly with the materials that nature provides. I have erected a series of domed structures emulating the natural arch of the invasive and prolific blackberry vines. If you crawl into the hut, be careful; the thorns remain so that they evoke the pain and sacrifice inherent in living on the margins of society. While these works echo the use of thorn barring plants to protect and exclude property, they also speak to the fundamental need for shelter. One significant outcome of working under the bridge has been the spontaneous interactions between the public, the sculptures and myself. In particular, the photo of the original native inhabitants of the area once called Snauq (circa 1891), framed by a crown of thorns placed above a red sofa acting as a flower bed, has led to many conversations with passers by. For instance, one day I met a young native girl out for her daily jog who calls this area the rez. She explained that although she is not from the area, she is involved with local natives who would like to create a web site about the ancient village of Snauq. I have also met some shady characters, troubled individuals, friendly neighbours, city workers, tourists and a whole troupe of actors who staged a performance under the bridge for a month. Most remarkable of all was a homeless man who was so taken with my work that he took a photo of it with his cell phone. This seemingly forgotten space and the issue of its ownership has been at the forefront of public debate of late because of the Squamish claims to the land plus the need to retrofit the bridge. I have spoken to a wide variety of people about the recent proposal by the Squamish to erect billboards along the Burrard Bridge. My understanding as a non-aboriginal is that the Squamish Nation, which has fought long and hard to regain rights to their ancestral land, regard advertising as their only recourse to generate revenue from this small parcel of land. Though a majority of Vancouverites support the Squamish’s aspirations toward self-sufficiency, most agree that it will be an unsightly addition to the historical bridge. Moreover, the ongoing civic debate regarding the expansion of the Burrard Bridge to accommodate the yearly increase of traffic usage has met with public opposition. After spending several months under the bridge I would conclude that the answer to my initial question, Who belongs here? to be All of us, regardless of the fact that on October 16, 2007 all of my installations were hauled away by an over zealous city crew upon their return to work after a three month city strike. Although I fully accept the risks involved in the creation of guerrilla art, I did appreciate that they did not destroy the word CLAIM, which was a few metres out of their jurisdiction. It stands as a reminder of the need for redress in regards to the colonial laws of land pre-emption and squatter’s rights. May the growth of this autumnal rye grass take root in our consciousness and imbed in us the first seeds of change. How did we lose the public's trust?